Support Center » Knowledgebase » How are domain transfers handled? Article After an auction ends, the buyer is automatically and immediately invoiced for the payment. The buyer will pay, and Bido will validate the payment. This validation may take 24-48 hours, or more. Once the payment is validated, the buyer and seller are informed. The seller is instructed to transfer the domain to the buyer. 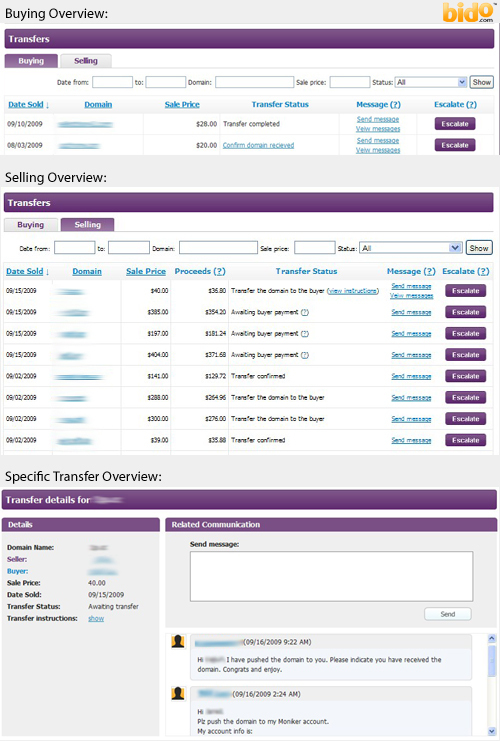 This interface is designed to assist buyers and sellers with transfers and make the process as fast and simple as possible. It's simple to send the other party a message and communicate about the sale. When sending the other party a message, you have the option to BCC (Blind Carbon Copy) a Bido Transfer Manager. The other party will not know that you BCC'd the manager. The manager will read the comments and take any action or provide any assistance that is required. In addition to this BCC feature, at the bottom of any transfer details page is a link to click to Escalate the transaction to support. This is an additional way to contact a Bido Transfer Manager, without sending a message to the other party. We are here for you every step of the way to make sure your transfer goes smoothly. If a buyer has paid for the domain, and then has gone unresponsive, after 10 days, sellers may Escalate the transaction and ask that Bido take the domain into Escrow status and process the payment of the auction's proceeds. There are a couple ways to transfer the registration rights of domain names. Sellers may ask the buyer for their account name or account ID at the current registrar (and perhaps a security code) (but not their password), and use that information to "push" the domain from the seller's account to the buyer's account. This is the easiest and quickest method of domain ownership transfer. Another method is having the seller "unlock" the domain and provide the buyer with an "EPP" transfer code. The buyer will use that code to place a transfer request at their preferred registrar of choice, in the case this registrar is a different registrar where the domain currently resides. Buyers and sellers can easily communicate about these things over the transfer panel. Once the seller transfers the domain to the buyer, there is a link the seller will click to indicate that the domain was transferred out of their account. The buyer is then sent a notice and asked to log in and confirm receipt. Once receipt is confirmed, Bido will issue the proceeds to the seller. If the buyer does not confirm (or decline) that the ownership transfer has been completed, within 10 days, the seller will automatically become eligible for payout by default. Seller payments are typically sent Monday - Friday within 24-48 hours of the sale being finalized.